These toddler socks are worked in worsted weight yarn making them quick to crochet. Thick and warm socks are great for wearing in snow boots or rain boots or just like sleepers around the house. This pattern is suitable for beginners as it only uses single crochet and chains, you need to know how to read and count your stitches though as there are increases and decreases involved. The socks are worked from the toe up. Increases are made for the gusset and then the heel opening is created. Then the sock is worked up to the ankle. The cuff is then worked sideways around the ankle and the side is seamed up afterward. We use back loop single crochet stitches for the cuff, which creates the stretchy fabric to make it easier to put them on. Lastly, the heel is worked into the heel opening. SIZE: To fit 5/6 toddler shoe size. FINISHED MEASUREMENTS: Foot length: 4.75″, foot circumference: 5″. Patons Classic Wool Worsted (100% wool; 210 yds [192 m]/3.5 oz [100 g]), #77219 seafoam. Cascade 220 Superwash (100% wool; 220 yds [200 m]/3.5 oz [100 g]), #804 amethyst. HOOK: US size G/6 (4.25 mm), or size needed to obtain gauge. GAUGE: 9 sts and 10 rows = 2″ in single crochet. RND 1: Sc in 2nd ch from hook and each ch across to last ch, 3 sc in last ch; working on the opposite side of the foundation ch, sc in next 5 chs, 2 sc in next ch – 16 sts. RND 2: (Sc in next 7 st, 3 sc in next st) twice – 20 sts. RND 3: Sc in next 8 sts, 2 sc in next st, sc in next 9 sts, 2 sc in next st, sc in next st – 22 sts. RND 1: Sc in each st around. Repeat rnd 1 – 10 more times, or until piece measures 2.75″ long from the foundation chain upwards. Mark side sts: Lay sock flat to prevent it from twisting, place Ms on both sides of the sock to separate 10 sts between Ms on the bottom of the foot. Next RND: (Sc in each st to marked st, 2 sc in marked st) twice, sc in remaining sts –24 sts. Repeat rnd 1 – 2 more times. RND 1: Sc in each st to market sts, ch 11, skip next 11 sts, sc in remaining sts – 24 sts. Repeat rnd 1 – 3 more times. Sl st in next st. Note: Ribbing is worked sideways and attached to the sock at the end of every odd row. ROW 1: Sc in 2nd ch from hook and each ch across – 8 sts. To connect ribbing to the sock sl st into next two sts on the ankle (sl sts do not count as sts). Turn. ROW 2: Working in back loops only, sc in each st across, turn. ROW 3: Ch 1 (does not count as st), working through back loops only, sc in each st across. Sl st twice to connect ribbing to the sock, turn. Repeat rows 2-3 around the ankle. Fasten off leaving 10″ long tail. With yarn needle sew the sides of the ribbing together. Place Ms at both corners of the heel opening. The first round is worked in the skipped sole sts, along opposite side of ch sts, and one extra st added at each M. With RS facing, join yarn anywhere along the edge of the heel opening. RND 1: Sc in each st around – 24 sts. RND 2: (Sc in each st to next M, sc2tog) twice, sc in remaining sts – 22 sts. Repeat rnd 2 – 3 more times. Last RND: (Sc2tog, sc in next st) around. Fasten off, leaving 10″ yarn tail. With right side facing, flatten remaining heel opening, align stitches, and sew opening to close using mattress stitch. Weave in ends. Hats are one of my favorite projects to crochet. This hat is easy and quick to make. It is worked from the top down in spiral rounds so there is no need for chaining or joining rounds with slip stitches. The hat starts with four rounds of increases and then is worked straight down. The main stitch used is double crochet stitch and the hat is edged with reverse single crochet. I am using bulky weight yarn so the hat is very quick to make. 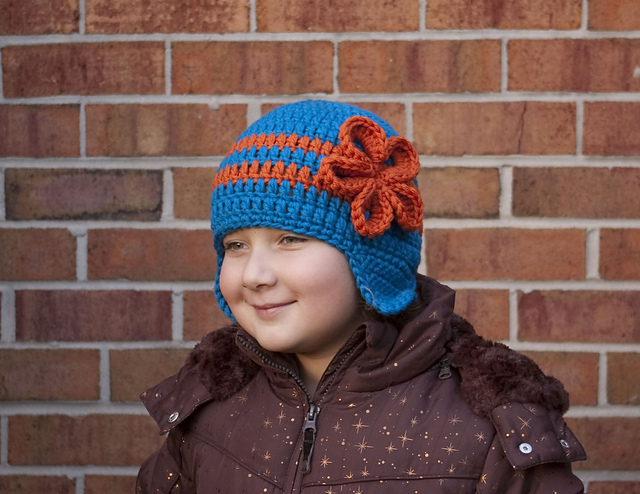 The video tutorial shows how to crochet this easy hat step by step. Finished size(s): To fit an average toddler. 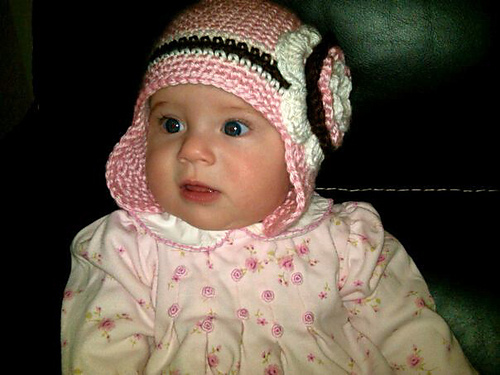 Finished Measurements: 18.5″ hat circumference. Sample Shown in: Patons ColorWul (100% wool; 90 yds [82 m]/3 oz [85 g]; CYCA #5), 1 skein. Hook: US size J/10 (6.0 mm). Or hook necessary to obtain gauge. This is a how to crochet tutorial showing how to crochet a shamrock clover. Three-leaf clover and four-leaf clover. Finished size: 2″ long and 1.5″ wide. Yarn: Worsted weight yarn in green. Hook: US size G/6 (4.25 mm). You can use any weight yarn and a crochet hook to match. Wow! Thank You!! I am blown away by the response to my initial post and video about the Octo Project. I am glad to know it has touched so many people. Based on the success of my original modified pattern I was inspired to create version 2.0. This version uses the same yarn and the same techniques, however it creates a new variety of the octopus with a different body shape. Not better, not worse, but different. It is longer and a little wider. Variety is the spice of life crochet. So I proudly present octo 2.0. Finished Measurements: About 8″ tall. Head circumference is about 8″. Curled up tentacles are about 4-5″ long, fully stretched cannot exceed 8″ for safety reasons. Yarn: Worsted weight 100% cotton yarn. I would recommend not using mercerized cotton as it is treated with chemicals to make yarn shinier. I would also recommend not using yellow color for preemies (bad juju). I have used Sugar n’ Cream which can be purchased at any big box craft store. It’s inexpensive, readily available and comes in a lot of colors. It could be a little hard on your hands as it needs to be crocheted at a tight gauge. Another great option that I will mostly be using is Hobby Lobby’s I Love This Cotton, very soft, great color selection. I Love This Cotton (100% cotton; 180 yds [165 m]/3.5 oz [100 g]). Hook: US size G/6 (4.25 mm). Or hook necessary to obtain gauge. Octo Project is a worldwide project that has crafters help preemies thrive by crocheting octopuses for babies in the NICU. The tentacles of the octopus resemble the umbilical cord and remind babies of the womb and comfort. This is a modified crochet pattern by Anastasia Popova to the original Octo Project pattern. Changes are made to accommodate worsted weight yarn and eliminate seeming. Finished Measurements: About 8″ tall. Head circumference is about 7″. Curled up tentacles are about 4-5″ long, fully stretched cannot exceed 8″ for safety reasons. Thank you for the free pattern and especially the video. I’m fairly new at crocheting and struggle with just a written pattern, but I can follow you doing it on the video. I just finished my first octopus & am so proud of myself. Love this! Could you update the written instructions telling us when to partially stuff the octopus, and then when to add the final amount of stuffing, for those that did not watch the video. Thank you so much for this video. I tried making one of these octopus is using a different set of instructions and gave up. I found your video and thoroughly enjoyed the clear instructions that you gave throughout the making of this toy. I am making these for the NICU babies in Savannah, Georgia. I had almost given up until I found your video. Thank you again!